Former Navy SEAL Rock Mackenzie must recover the stolen gold sovereigns. Time is running out on the loan repayment for his treasure hunt and unless he finds the coins, he will forfeit a family heirloom and all hope of finding the sunken ship carrying the rest of the gold. Pink-haired florist Jeanie Munro learned responsibility the hard way after her ex-husband abandoned her and their two children. Once a wild child with a heart for adventure, Jeanie finds herself falling for yet another bad boy dreamer—until thieves ransack her shop and home and Rock reveals her ex is to blame for her troubles. In return for his protection, Jeanie agrees to help search for the missing coins. Will their thirst for adventure get them killed, or will they discover the true meaning of treasure before it’s too late? Book 3 in Maggie Toussaint’s Mossy Bog Romantic Suspense series pairs brains and brawn in a race against time. For fans of Jayne Ann Krentz, Sandra Brown, and Karen Harper. “When a mystery author takes on the romantic suspense genre, the potential for an amazing read is high! Jeanie Munro is struggling to make ends meet after her husband Avery walked out on her and their kids for another woman. When she meets the dangerous looking but very sweet James “Rock” Mackenzie, Jeanie begins to long for the wildness of her youth again. But Rock isn’t being 100% honest with her, and after befriending her and her family and figuring out that he has a thing for the pink-haired spitfire, he’s forced to admit that he targeted her for a reason. 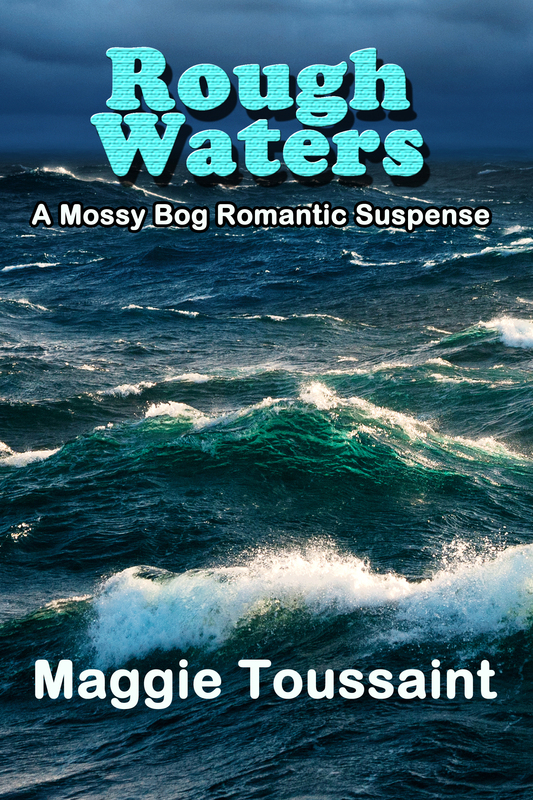 “Maggie Toussaint’s Rough Waters is a romantic/adventure/mystery, well written and packing a lot of punch. Ms. Toussaint is a writer of expertise and imagination, who deftly establishes the characters, time, location, and potential conflict right away. She intrigues you with lively dialog and characters you believe in, as her plot unfolds one page at a time. Guided by her skills, we suspect we know where we’re going but not how we’re going to get there. Time to settle back for a good read. In the story, a young divorcee named Jeanie is harassed by an unknown villain who not only threatens her home and business, but her life and the lives of her two young children. Coming to the rescue is a former Navy SEAL, Rock. He has his own agenda, but finds himself attracted to the feisty woman, whose pink-tipped hair only peaks his interest. There are blown-up boats, treasure hunts, missing coins, and a lusty young couple ready for it all. So are we. “Rough Waters, rife with cozy atmosphere, is set in the small town of Mossy Bog, where everyone knows everyone else’s business. Who couldn’t empathize with Jeanie Munro, an ordinary floral shop owner, who has her hands full raising two children alone, in the wake of her husband’s desertion? How could one not feel sorry for the larger-than-life Rock Mackenzie, at his wits end when his valuable coins go missing, and his livelihood depends on their retrieval? And, to make him more appealing, he’s not only wounded, but is also a dog lover. When the two’s paths collide, they’re faced with the multiple challenges of danger, distrust, and attraction. Can they survive with bodies and hearts intact? “The third in Maggie Toussaint’s Mossy Bog Series, this one tells the story of Jeanie Munro, a single mother with a thing for bad boys. Enter: Former Navy SEAL, Rock Mackenzie, looking for Jeanie’s ex, who he suspects stole his gold coins. He befriends Jeanie, who falls for him, only to discover his hidden agenda. The story hooks the reader right from the start and doesn’t let go. Mystery, suspense, betrayal, danger, and romance all make for rough waters, and a satisfying read. “The thing I love about mysteries and especially amateur sleuth mysteries is the wealth of characters the sleuth is involved with. In the typical cozy mystery anything goes: hobbies, cupcakes, crafts, children, extended families, nosy neighbors, bossy mother-in-laws, matchmaking aunts, and other quirky characters. 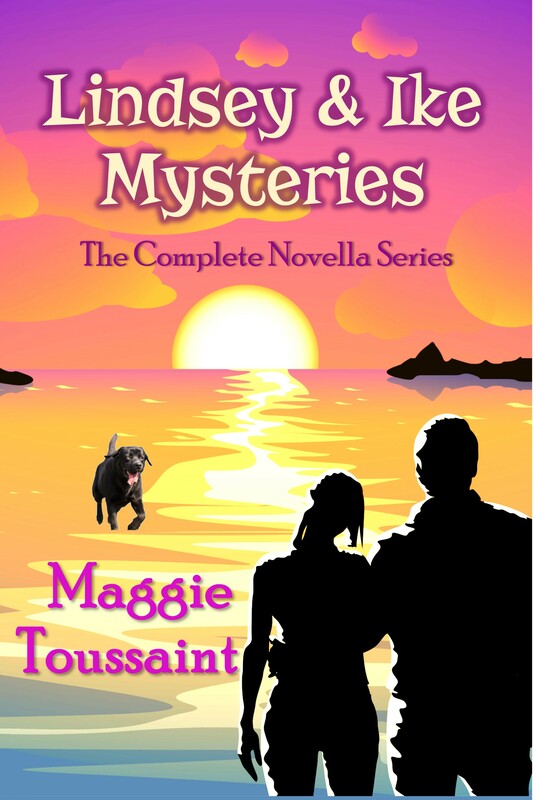 In Maggie Toussaint’s newest romantic mystery, many of the elements of a cozy mystery show up- small coastal town, a strong female florist heroine, protective mother and best friend, a treasure hunting navy seal, and two adorable kids. She is able to weave the story into a page turning romantic mystery with numerous plot twists. The heroine is a struggling divorced mother of two trying to make a go of a florist shop in a small coastal town. After a divorce from a cheating husband who abandoned her and her two children under age 4 the last thing she needs is to have her business trashed. A Navy seal shows up in town after he was injured in a boat explosion looking for treasure he believes her ex-husband stole from him. He never expects to be attracted to her and her family or that the strong mother would help him look for his treasure. Pros: Well written and wonderfully drawn characters makes it easy to connect with them. He was quiet so long the hair on the back of her neck snapped to attention. Cuss words roiled in her craw like crabs in the cook pot. Jeanie glanced at the sling supporting Rock’s left arm. A horrible possibility occurred to her, a possibility so scary her vision whited out. She hung onto the kitchen counter until shapes and colors came back into view. Her knees sagged. A needle of betrayal stabbed her heart. Damn you, Avery. How many lives do you have to ruin? It wasn’t enough that you threw away me and the kids? You had to go and maim a perfect stranger? The room began to spin. It floated in and out of focus. The harsh planes of Rock’s beard-stubbled face tightened at that. The pink scar on his left cheek darkened. This really was about Avery.